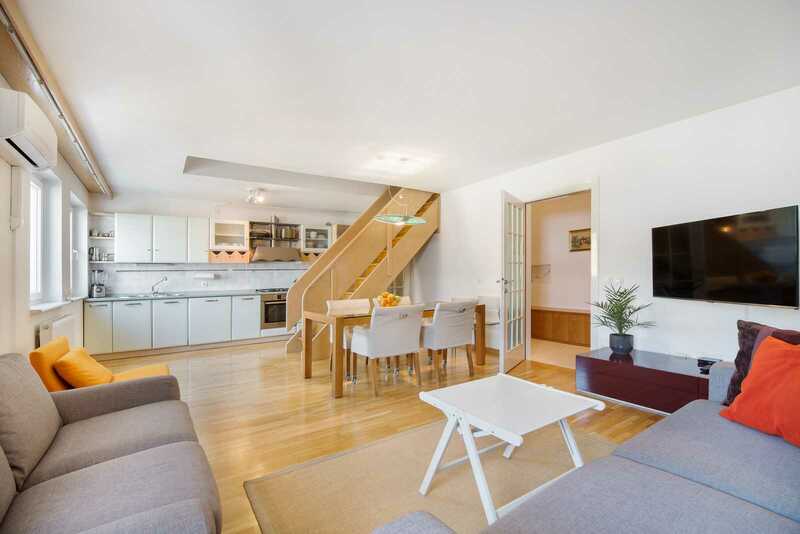 If you are arriving in Ljubljana with a train or bus, this stylish 2-bedroom apartment is the closest to the Central Stations of all our Ljubljana apartments. 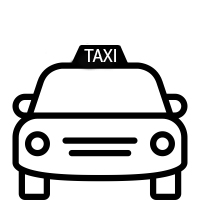 (If you are driving, there are many parking options available, but no private parking). 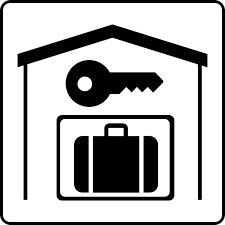 You don’t even have to call and wait for a taxi because in just short 10 minutes you’ll be unpacking your bags in your Ljubljana apartment at Dalmatinova street 10. 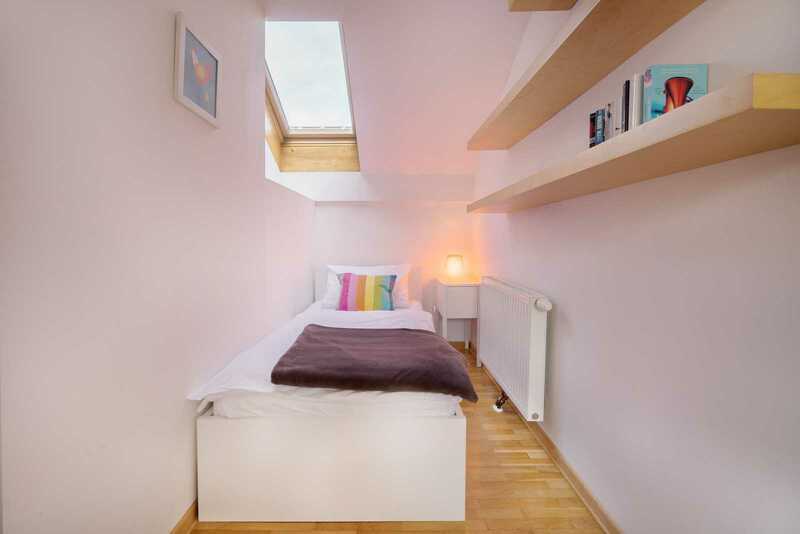 First thing you’ll notice is that the apartment is colorful, bright and very quiet. It’s on the forth floor so the sounds of the busy city (which is really not that busy) stay pretty much away from it. 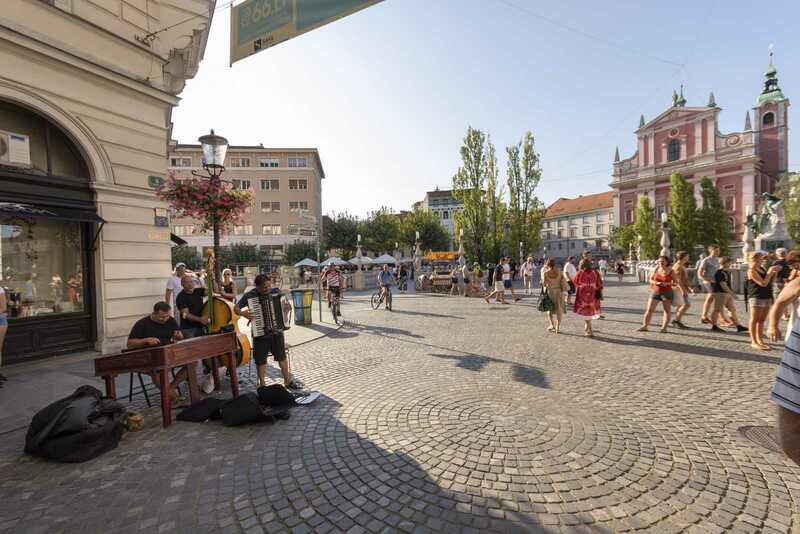 But best of all, Preseren Square, Ljubljana’s social hub, the epicenter of the center of Ljubljana, is just around the corner. Picture this. 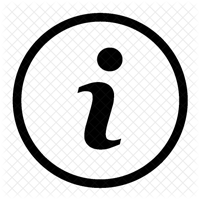 You’ve made arrangements with your friends to meet by Preseren statue (THE meeting point in Ljubljana) at, let’s say, 7:00 pm. You can leave your apartment at 6:58 pm and be on time. 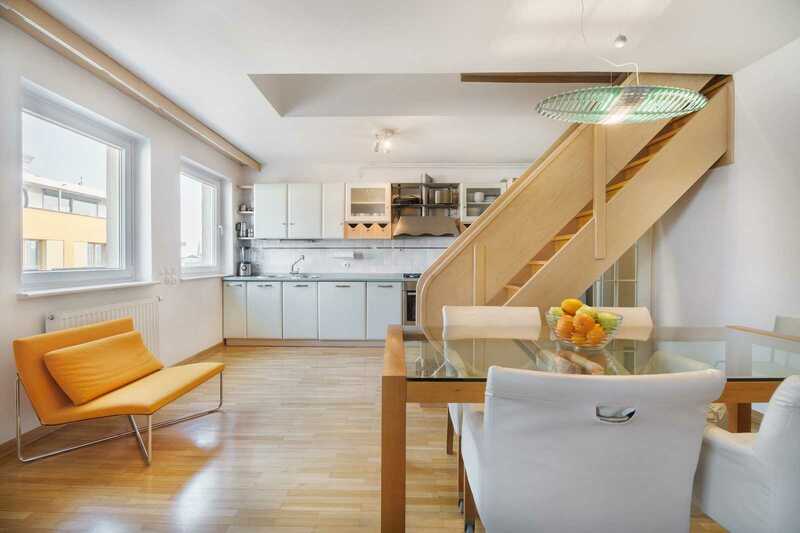 This is another open and spacious apartment in our selection of Fine Ljubljana Apartments. Kitchen, dining room, living room… it’s all one big space. Living room (picture below) is the center of everything. 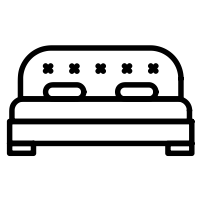 The living room has a brand new high quality sofa bed, which sleeps two adults easily. Behind me (taking a photo) is one bedroom, in front you can see the kitchen and a dining table and behind it a wooden staircase that lead to the master bedroom. 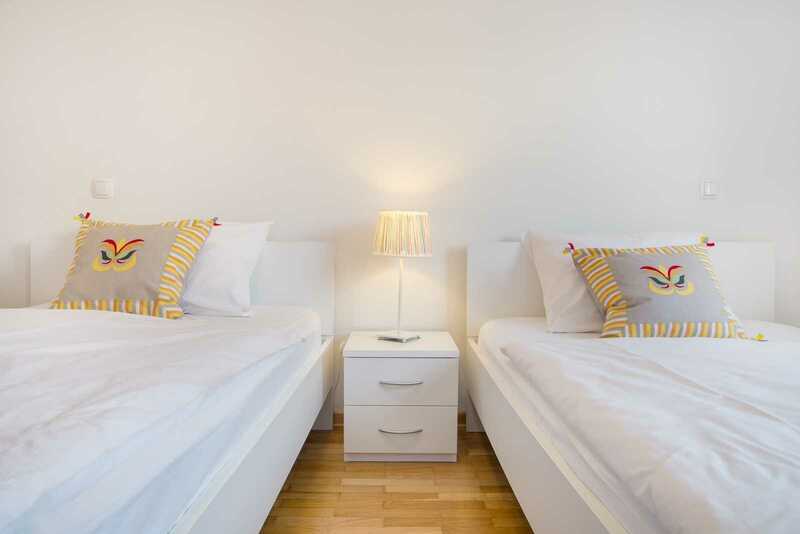 Two things are essential for a comfortable stay in a rental apartment. 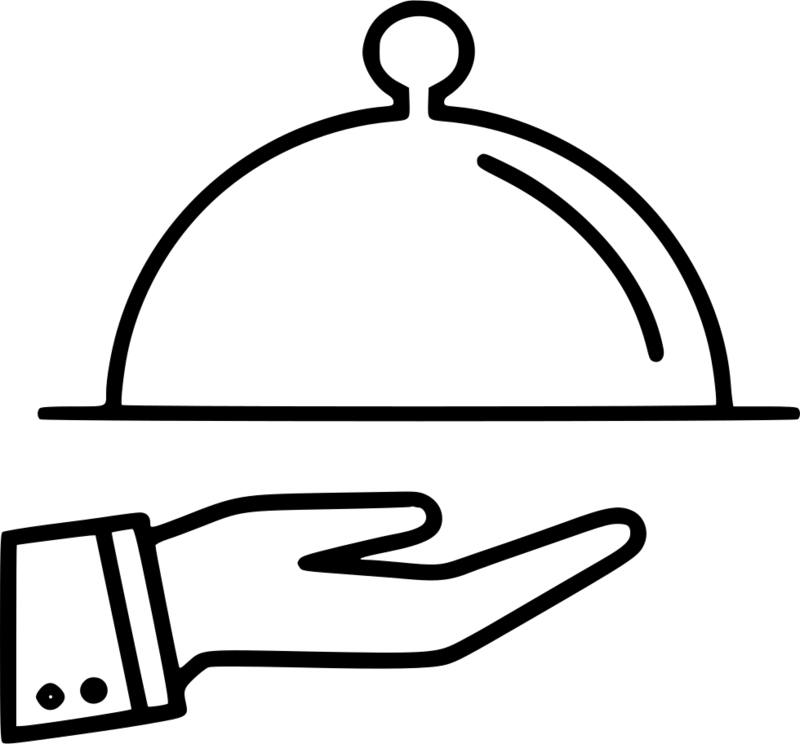 The ability to set the right temperature and a WiFi Internet (not breaking down). 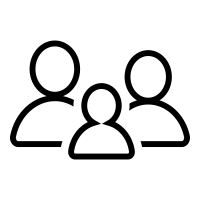 There is strong and fast WiFi Internet on both floors of Dalmatinova apartment… and it’s not breaking down. Temperature in the summer is controlled by two air-conditioning units, one on the lower and one on the upper floor. In the colder months your can regulate the temperature in each room by adjusting the thermostatic valves on the radiators. 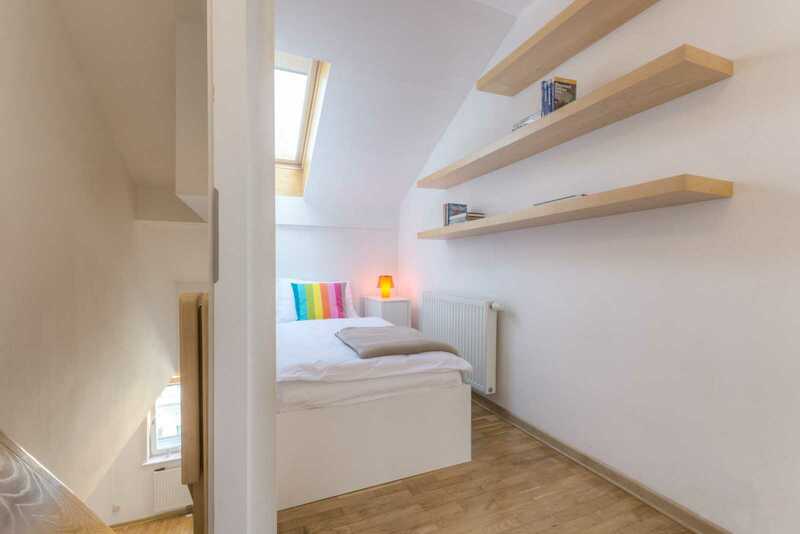 Now that we put these essentials out of the way, let’s take a peek at all the rooms and spaces of this 2-bedroom Ljubljana apartment. Let’s start at the begining. At the entrance from the street. The entrance is right across the street from City Hotel at Dalmatinova. You can’t miss it, it’s the big brown door at number 10. When you arrive our greeter will be waiting for you in front of the apartment building and show you up. If you are expecting visitors, you can easily open the entrance street door from a white intercom that you can see on the the photo above. 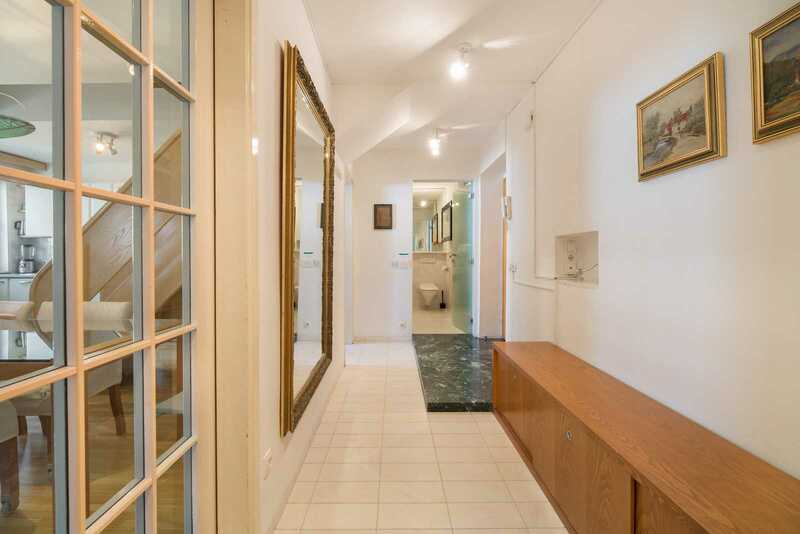 On the right from the front door is a bathroom. Big and elegant with lots of frosted glass and mirrors. 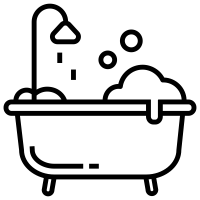 Fresh towels will be waiting for you here, plus other bathroom necessities and, last but not least, detergent powder and softener for a washing machine. 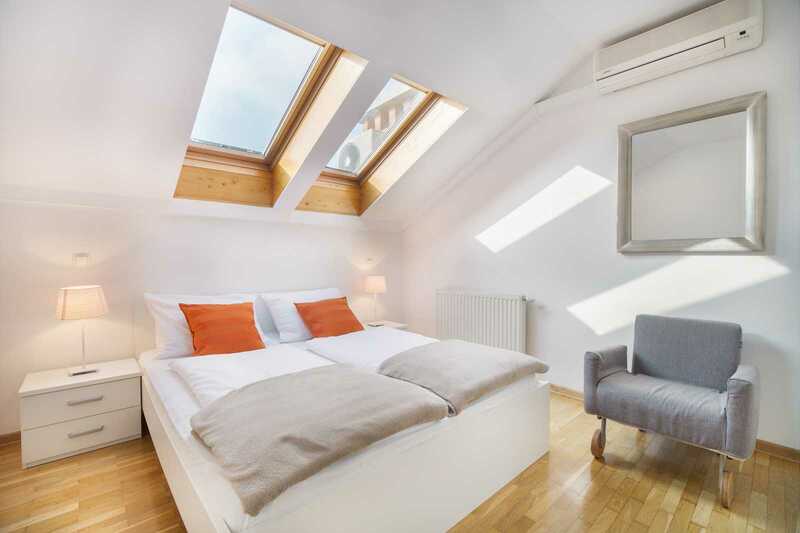 Five persons can comfortably sleep in this cozy Ljubljana apartment. Two in the bedroom on the lower floor and two in the master bedroom on the upper floor. A fifth person can sleep on the folding bed which can be put in any room in the apartment. (Sofa in the living room can also be used as a bed but it’s not very comfortable). There is also a baby cot in the apartment (at no extra charge) which can be placed in any bedroom in the apartment or in the living room. 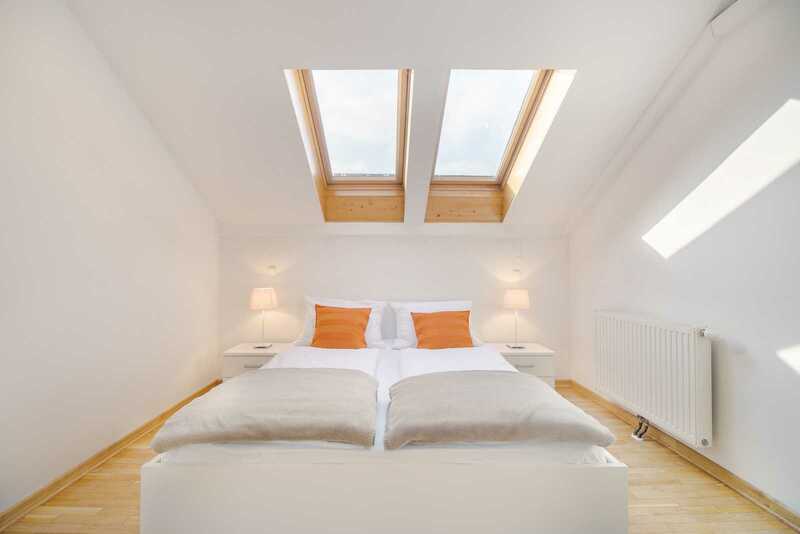 The bedroom on the photo above has two 120cm-wide beds. They are from the same series so they can be pulled together to form a big king’s bed or “family” bed if needed. Let’s go now back to the living/dining space (two doors connect it with the hallway). Kitchen is fully equipped, there is really everything you need for preparing meals. Prices are for 2 persons per night. 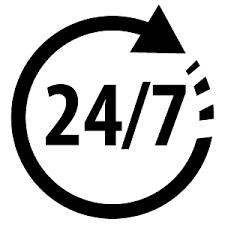 For an additional adult please add €23 per night, for a child between 4 and 12 years €11.5 per night. Children under 4 stay free of charge. City tax is not included in the prices. The house is large and bright,7 people can sleep comfortably. It is quiet and the location is great, everything was 500m from us at best. I received very fast answers to any questions I had. The apartment is in a great location. 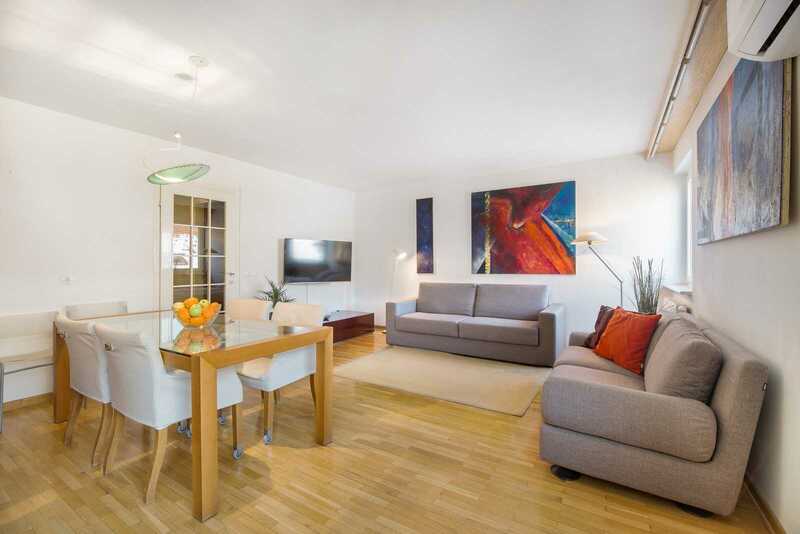 The apartment has a very spacious layout and the location is very convenient. The apartment was very cozy, nice and comfortable. The beds were great. The greeter was very precise and professional, too. In an excellent location, clean and well equipped. The greeter spoke perfect English and she explained everything very clearly. 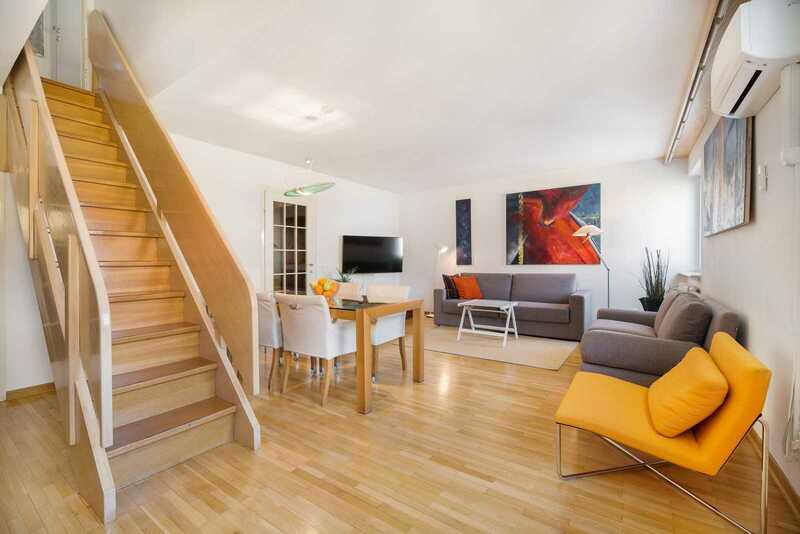 The apartment is modern, very clean and very well located while managing to be quiet. The air conditioning is also a real asset in August. The apartment, the location and basically everything was excellent. We loved it! A very central yet peaceful place. It’s spacious and modern. There’s a great bar and also a coffee shop at the back of the building. 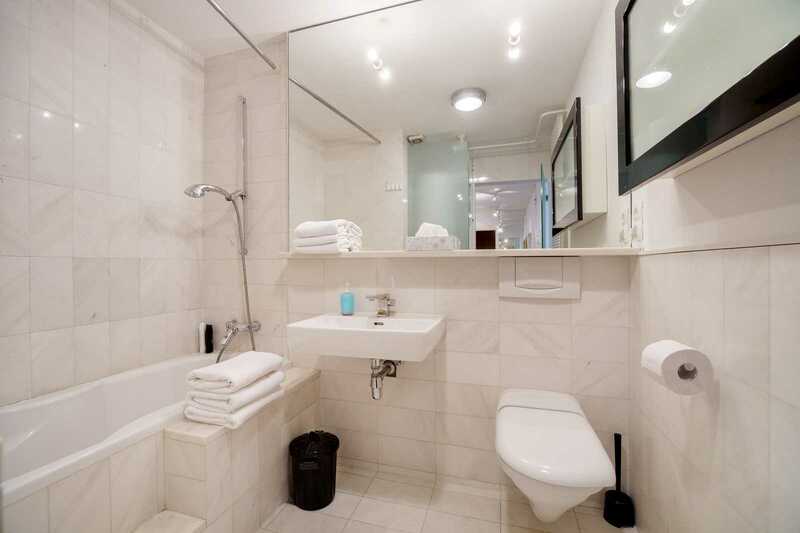 Our apartment in Ljubljana was centrally located, clean, modern and very well equipped. The girl who met us was very lovely, friendly and helpful. A very nice apartment with a perfect location. All the rooms were nice and the beds comfy. The person who welcomed us was very helpful too. We received a friendly welcome with a very useful map, denoting supermarkets, key sights etc. 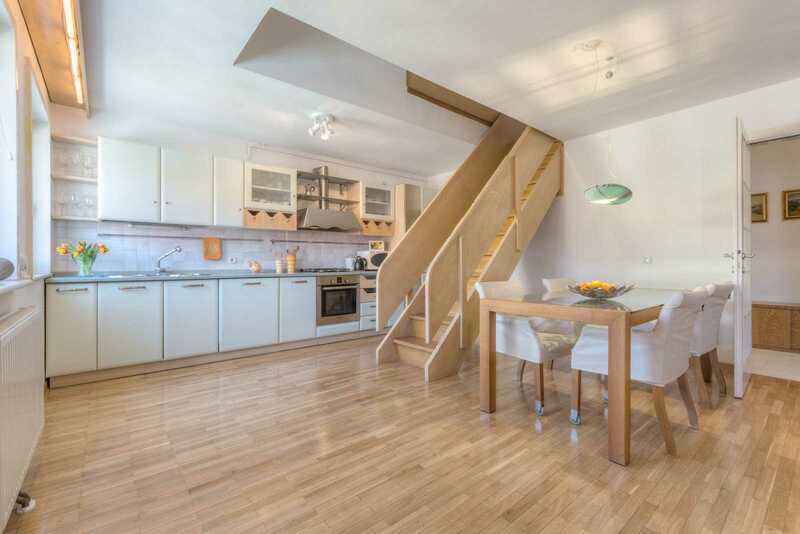 It’s a very clean and comfortable 2-level spacious apartment with 3 bedrooms in a fantastic location. A very spacious apartment with all the comforts one would expect. 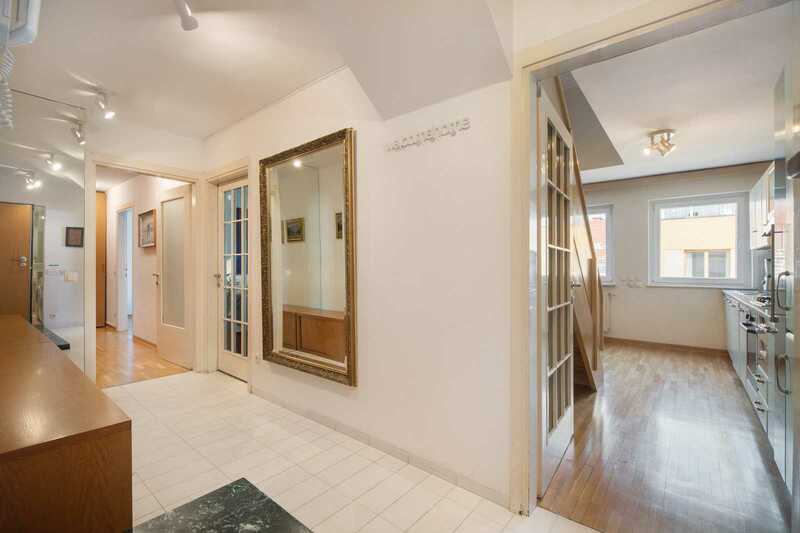 It has a great location – you are within walking distance of the center. 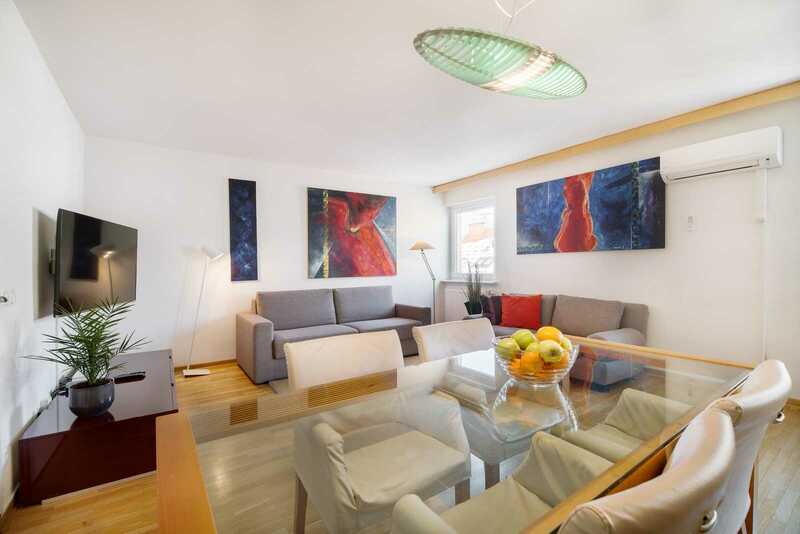 A great apartment for a family, with a very central location. 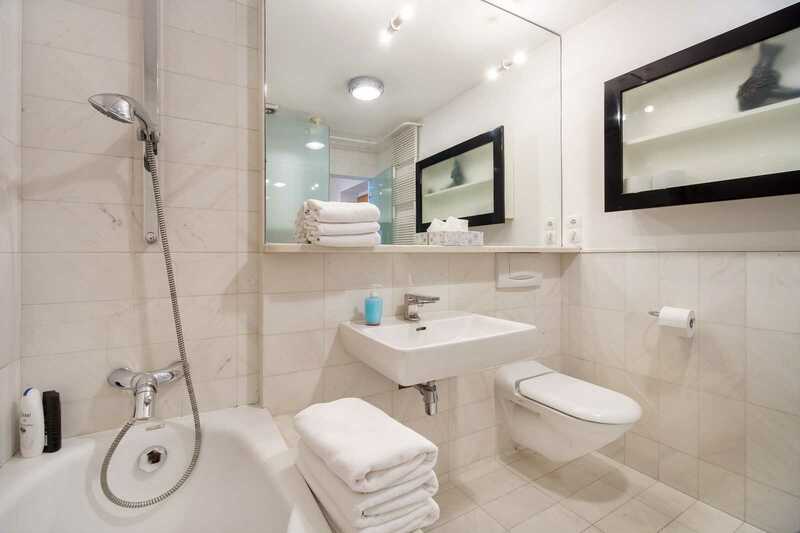 The apartment is clean and practical, and the location is ideal. The hosts were very quick to reply to every question and very friendly. All in all, a great stay! The apartment is in a super central location, not far from the center of the town and within walking distance of pretty much everything you could want to get to. The apartment was comfortable and a great base for our explorations. We stayed here for 2 nights and it’s in a great location, within walking distance of everything. My family and I stayed in this wonderful and spacious apartment for 3 days. Our host Christina was super friendly and informative. I can’t recommend this enough! We loved every minute we had in this place. It was quiet, cozy and in a perfect location. It felt like home. The team of Fine Ljublijana Apartments was friendly and helpful. 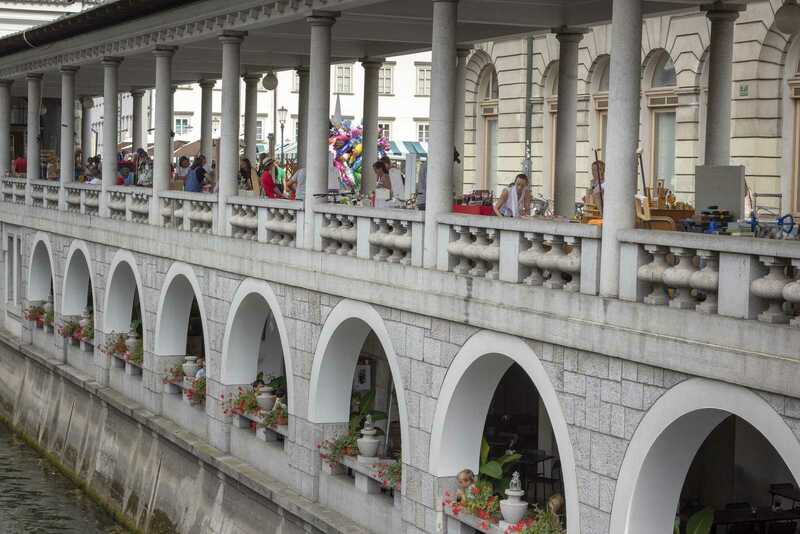 They provided us with a lot of information about Ljubljana upon arrival and the flat was just as we expected. We were very satisfied with our stay and can only recommend it. 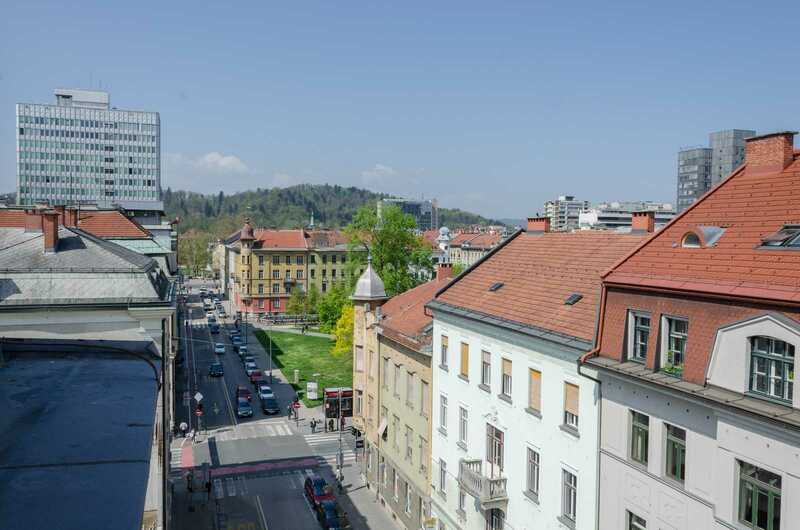 This apartment has a super location and I would highly recommend this place to all looking to stay in the heart of Ljubljana. Everything was alright. The flat is near the center, only 3 minutes away on foot. 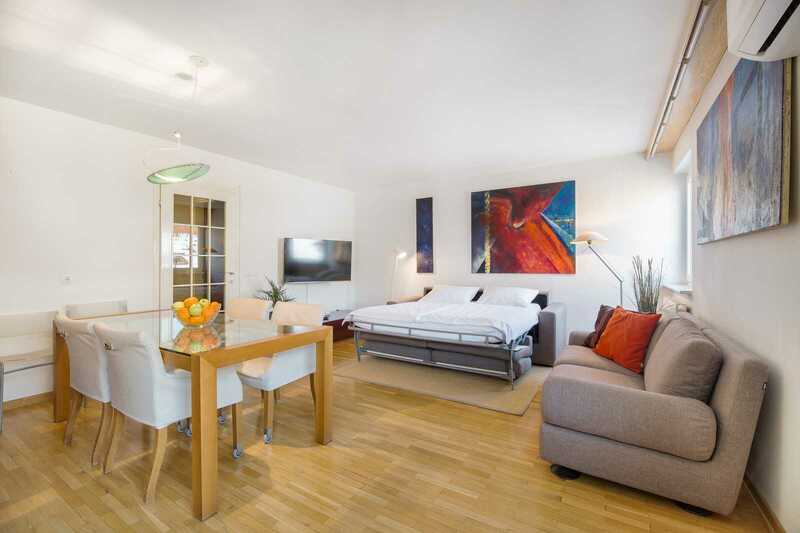 An excellent, well-located and superbly equipped apartment, with quality furnishings. I highly recommend it. A clean and modern apartment. 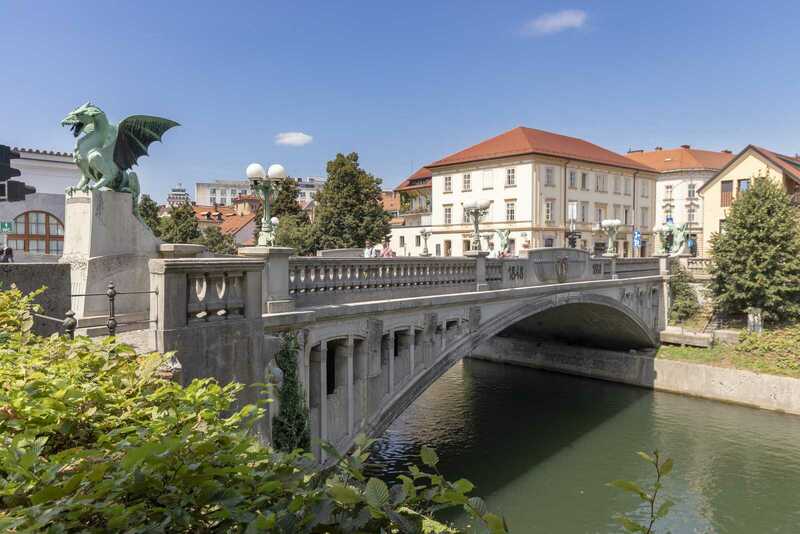 It has a perfect location for exploring Ljubljana. The hostess was really nice as well! Thank you very much. 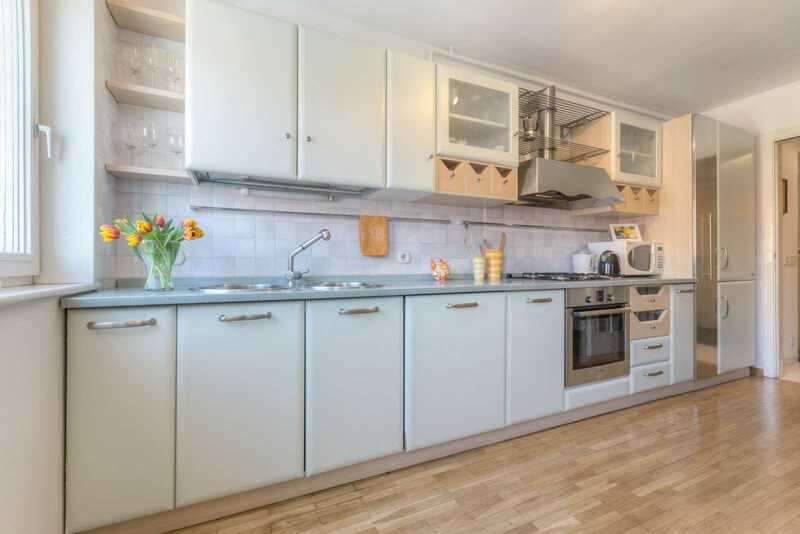 Check out this fine FLA apartment: Two-Bedroom Dalmatinova Apartment – Apartments for Rent in Ljubljana.